I travel to experience new and creative spaces and eat lots of food (obviously,) so once Anna and I unpacked our bags and realized we had a unique and beautiful room all to ourselves...we didn't feel the need to leave! I know some people put their hotel low on the totem pole of priorities, after all, it's just for sleeping right? WRONG! It's where you start and end your day and find peace in your adventures. If I can find a hotel where the spaces I come to experience are in the lounge area of my own room, I'm telling ya, it takes your trip out of this world! The blue tiles, fur chairs, gold fixtures, and city views, I can't ask for much more. The entire room was lined with floor to ceiling windows and a remote to shut out the world at your fingertips. Think of Kate Winslet in The Holiday, pure joy! We had a shower big enough to sing and dance in (I checked...), a chic porcelain bathtub that overlooks all of Manhattan – WOW– lounge area with velvet and fur furniture, and balcony with a stunning city view. All the charming details didn't go unnoticed. You can see a little more of the hotel in this post! Brooklyn is its own little world; everything you need is just a few blocks away without the unwanted company of overflowing sidewalks. Not to say that there will be a seat for you in every coffee shop and restaurant, it's still New York! Reservations will be your friend. Anna and I were on the hunt for some eclectic atmospheres, strong cappuccinos, and tasty food. Here's what we found! Sunday in Brooklyn… a personal favorite! After shivering on the Brooklyn Bridge Anna, Jules and I popped in to warm up over some hot coffee and pancakes. Their space is so warm and inviting, white marble tabletops, wooden bookshelves, and hanging greens. The perfect mixture of chic and natural. They have AMAZING coffee cake and the thickest pancakes I've ever seen! The picture above is from Sunday in Brooklyn. Full of laptops, open books and floor to ceiling bookshelves. It’s crowded, but for good reason, the coffee is TOP KNOTCH! My avocado toast was on point too, so if you can find a seat head in and stay awhile. Simply said, the best brussel sprouts I have EVER had! If you don't know me, that's a bold statement. So crispy, so flavorful, with a brick oven pizza on the side, just perfect. You better believe we didn't leave a single crumb. Dim lit, lively and all the meatball options you could dream of. Oddly the sides were some of my favorites! They've got it all. 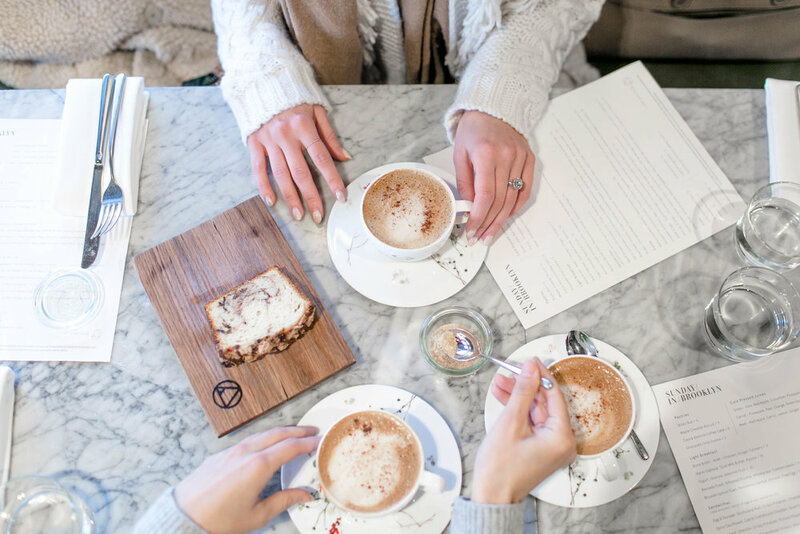 Darling marble countertops with sweet florals, we love this bright little coffee shop! As a pastry obsessed individual, I feel the need to tell you about the doughnut situation in Brooklyn… because it’s dough-licious! If you like the big, fluffy, doughy, and drool-worthy style (I have both hands in the air) make your way to Dough Doughnuts. For those of you who prefer the perfectly structured and sweet cake doughnuts (still have both hands waving over here) Du’s Doughnuts (pictured above) is just one block away from the hotel and to die for! I normally love a ton of crazy flavors, but their vanilla was simply perfect. ALL PICTURES BY THE WONDERFUL ANNA AHERN, A TRAVELING WEDDING PHOTOGRAPHER. IF YOU NEED ONE, I HIGHLY RECOMMEND HER, SHE SHOT MINE 4 YEARS AGO!